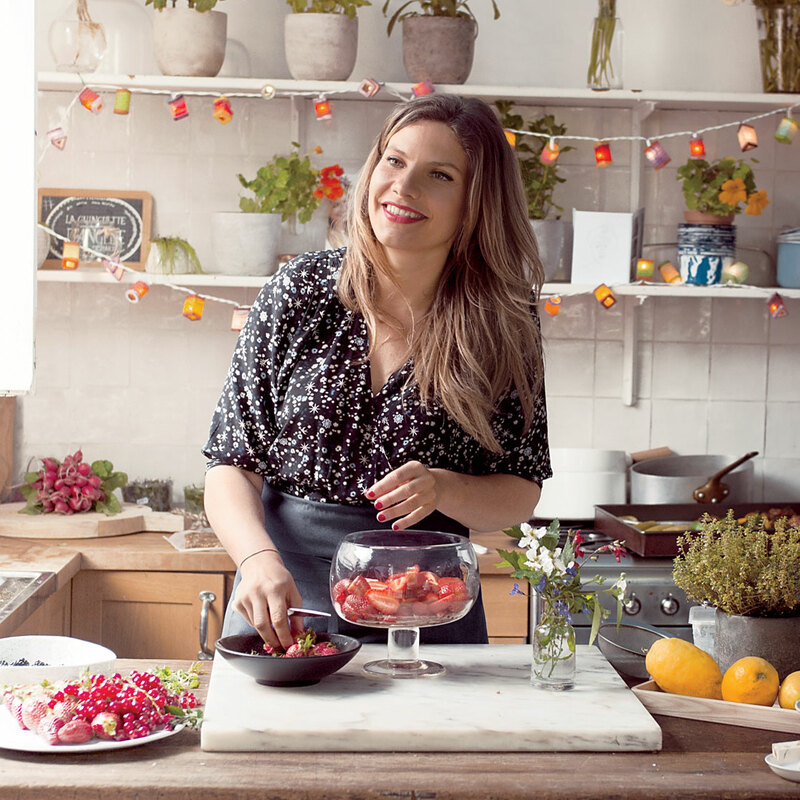 With her chic, casual approach to vegetable-forward cooking, self-taught chef and naturopath Angèle Ferreux-Maeght is waking Parisians up to a new way of eating. The line is short this morning at the greengrocer A La Bonne Ménagère (The Good Housewife—7-8 Rue Daguerre, 75014). That’s because it’s August and it’s hot; most of Paris emptied out last weekend for a monthlong holiday, clogging the autoroutes from here to Saint-Tropez. So today on the rue Daguerre, a cobbled pedestrian market street in Montparnasse on the Left Bank where cart-toting shoppers usually dodge chalkboard menu easels, the organic fruit-and-vegetable vendor, Monsieur Benayed, has extra time for gossiping with longtime neighbor Angèle Ferreux-Maeght. Ferreux-Maeght, who grew up on the close-knit rue Daguerre and now has her atelier in her family compound, is leaving for a break soon, too. To catch up with city friends and family before they all disperse, she’s hosting lunch in the courtyard. The menu reads like an itinerary of her anticipated stops in the coming weeks. Pillowy sweet potato gnocchi drizzled with pine nut–herb sauce suggests Italy, the first leg of vacation. The rest—virgin pastis, petits farcis (stuffed vegetables), a tart topped with fragrant berries from A La Bonne Ménagère—owes an obvious debt to her next stop, the Côte d’Azur, where she lived until the age of five and still visits every summer. Her vegetable-leaning cooking (she’s not a purist) has its roots in the kitchen garden of a Grasse farm, near Nice, where she spent her earliest years. Coming from art-world royalty on her mother’s side and film on her father’s (Benoît Ferreux starred in Louis Malle’s Murmur of the Heart), Ferreux-Maeght nevertheless chose her own path. The first stirrings of a gourmet wellness lifestyle came in 2006 when she was studying at the French American International School in San Francisco. The city’s liberal tech culture was the initial draw, but she was soon taken with its eco-consciousness as well. When the trained naturopath and self-taught chef launched her Paris catering company in 2013, most Parisians still saw a meal without meat as a form of deprivation. But her colorful menu was a megahit with designer clients such as Schiaparelli, Christian Louboutin and Isabel Marant, and she opened a chic takeaway counter in the Place des Victoires fashion district in 2015, followed last year by a cookbook, a line of healthy snacks and a tea salon in the 11th arrondissement, a hub for the capital’s young entrepreneurs. Ferreux-Maeght also consults for Alain Ducasse, whose eponymous restaurant in Paris’s Hôtel Plaza Athénée earned three Michelin stars for its menu focused around vegetables, grains and sustainable seafood. And, a few days from now, while she’s swimming in the Mediterranean, she’ll add TV to her résumé when she debuts as the face of Aux Racines de la Longévité, a new French series about wellness and longevity. So how does a successful Parisian caterer run her own party? It’s more laid-back than you’d think. The chef is still stuffing tomatoes, zucchini and onions in her cheery blue-and-white kitchen when girlhood pal Aimie Ferry-Sauvaire arrives and helps herself to a glass of iced “pastis,” infused with star anise, fennel seeds and licorice root. Ferry-Sauvaire, an international project manager at L’Oréal, is pregnant, so the nonalcoholic apéro is especially appreciated. She moved home from China two years ago to raise her own family on the rue Daguerre, and she’s noticed a new bounty of vegetarian, vegan and gluten-free dishes across Paris, from neighborhood bistros to bastions of haute cuisine.